Frustrated with being unable to address the needs of homeless people during the 30-minute police custody assessments he carries out, Eric Teague-Hellon set up care-at-night shelters to reach and treat this vulnerable group. 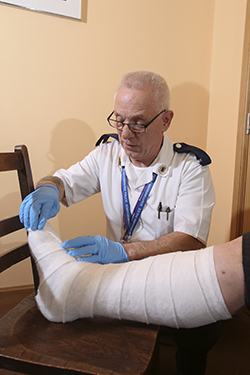 In his own time, he cares for a wide range of conditions, dressing leg ulcers and signposting or referring to healthcare agencies for mental health and other issues. For his commitment to his patients and the extensive scope of nursing care he delivers to this neglected population, Mr Teague-Hellon was named winner of the Superdrug-sponsored community award category of the 2018 RCNi Nurse Awards in conjunction with Primary Health Care. His service means that the custody unit can refer homeless detainees to the shelters rather than keeping them locked up in a cell overnight. The arrest rate of the people he sees at the shelters has significantly dropped and, in most cases, they have not reoffended. Mr Teague-Hellon also provides foodbank vouchers for those in crisis to feed their families. The judges were particularly impressed by the project’s scope and successes and by the amount of personal time Mr Teague-Hellon has given up to provide care for homeless people in his community. One said that his initiative shows a great deal of dedication and support for a part of the community that can often be overlooked, adding ‘he has genuinely made an impact on many vulnerable people and demonstrated a great collaborative working approach, to make a real difference’. Winning the award will help Mr Teague-Hellon in his quest to help others start similar outreach projects. He is now developing plans to roll out the platform to other custody facilities to provide first class nursing care across the board.